Make Sure You Do These Three Things This Fall - Peake Management, Inc. Even if your home stands four stories tall, leaves can and will find their way into your gutters. Clogged gutters can cause roof leaks and even flooded basements (been there!). Gutters are designed to direct the water away from your foundation. If water can’t make its way to your downspouts, it will overflow and hit directly at your foundation which leads to water intrusion. You’ll find it is far more costly and labor intensive to coordinate remediation of a leak or flood than it is to contract someone to come clear your gutters or even to tackle them yourself. If you live in a heavily wooded area, you will likely need to clear your gutters more than once in the fall season. Don’t be fooled by the false security of gutter guards; even those need to be maintained. The mesh guards, in particular, allow pine needles, other debris and muck to pile up in your gutters. With mesh guards you’ll want to periodically spray the gutters with water to keep them clear of debris and open for rain water to flow freely to the downspouts. There are lots of reasons we rake our lawns in the fall. Sure, some of us are bound by HOA regulations and others by glaring neighbors but, looking beyond that, we get to the root of what should motivate us… raking leaves is just good for lawn health. A thick layer of leaves on your lawn can suffocate the grass. Even worse, when a layer of snow is added to those neglected leaves? We get the dreaded snow mold which is fatal to our grass and not great for our own health. Under all those leaves, your grass is deprived of air, water, nutrients and sunlight all of which are critical to the health of cool grasses which are found in our area and (not surprisingly) most active in the fall. Make sure to clear thick layers of leaves but don’t go mad after every leaf. You can use a mulching mower to shred strays or thin layers of leaves and it will actually serve as a fertilizer for your lawn. This is one chore you can get the whole family in on and use as bonding time so don’t wait until the last minute. Set aside a day and tackle that yard! Frozen pipes can cause a lot of damage and cost a lot of money to repair. Your hose bib is a common culprit of frozen pipes. To prevent this in your home, you will need to winterize your hose bib. 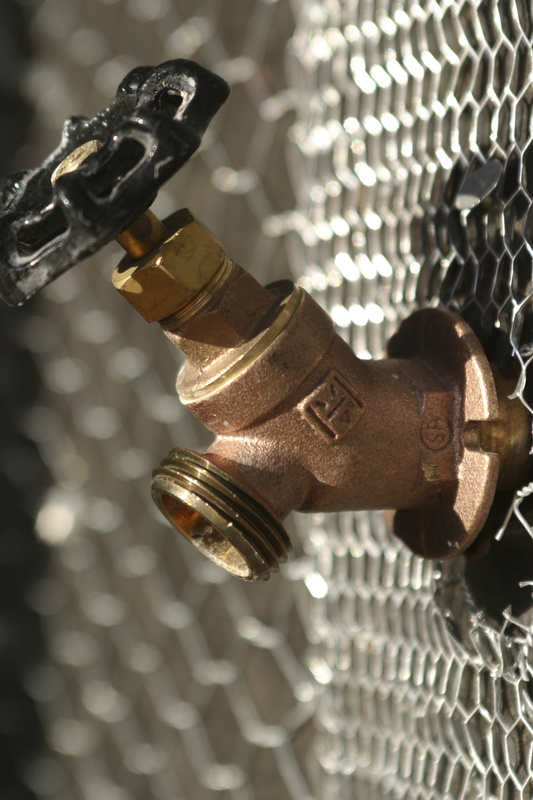 Before the first frost, locate the interior shut off valves to your exterior hose bibs. You can typically find the shut off valve by following the pipes in your ceiling if you have a basement or checking under sinks that share a wall with a hose bib. Once you have located the valve, turn it all the way off. Make sure the valve is securely closed or water may still be able to get through to the hose bib. When you are confident it is closed, walk outside to remove the hose and open the bib. Allow the water to drain out completely and then leave the bib OPEN through the winter. This will ensure that if any water does enter the bib, it will drain out instead of freezing. When you are ready to use your hose again in the spring, remember to close the bib outside before switching the interior valve back on.